Have you ever read and heard a verse hundreds of times when suddenly you read and a light bulb pops on? I can almost see a physical light bulb over my head that miraculously pops on!!! See, I've read these 2 verses so many times. I've preached them just as many times as I've read them. But during the last 4 or 5 months God has been really bringing them to my heart in a newly illuminated way. It's almost as if He's telling me that I need to go back to the beginning. I feel like He's telling me I've forgotten what it's all about! A couple of weeks ago, I told my congregation that God had revealed to me that we, as Christians, are SELFISH! At least, some Christians fall into that category...and sadly, I'm one of them. Next to the Lord, my husband and my family are the most important things in the world to me. Yes, I know, that's just like it should be. Well, I am almost obsessed with my family. I would rather be with them than almost any other place in this world. If I have the opportunity to be with them, I'm going to be with them. There is little in the world that would take me away from an opportunity to be with any one or all of them. We are a very close family (but there's always room for more closeness, right! Lol!) I won't miss an opportunity to be with them. That being said, I really feel like God is telling me that that's how I need to be with His children! Oh! Really! But God... I feel like His 'agape' love has somehow escaped me. If no one else but me needs to hear this, then so be it! We are to love others...even the unlovable...like He loves us. We need to have a heart for the lost like He does. It needs to break our heart to see the lost of this world. It needs to be a forethought, not an afterthought, to serve others. We need to love so much that we would be willing to lay our own life down for the lost...just like Jesus did! I truly believe that God has brought these 2 scriptures to my heart for a reason. I feel like He's telling me that I haven't been living up to my full potential as a child of God! Let me ask you something. Are you finding yourself in the same boat? Do you feel that you've been giving 100% of YOU to the work of the Kingdom? Do you believe that there's room for you to do more? If you do, then why not join me in going back to the beginning. Let's really begin to see others through the eyes of God. Let's really take some time to listen; because when we truly listen to the hearts cry of the lost, we'll have the compassion we're supposed to have. We'll want to share the Light with them. 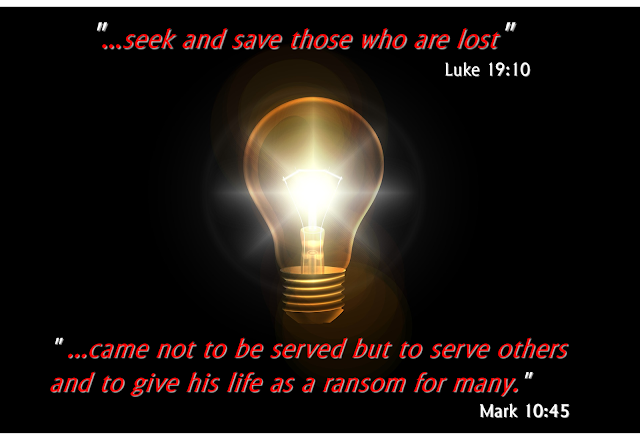 We'll want to serve others with the love of Jesus! Think about these things. Make up your own mind as to whether or not God is speaking to YOU like He is me.